Those of you who are enjoying the second series of That Mitchell and Webb Look might like to know that the series is due on disc on March the 31st, from Fremantle. In the meantime, anyone who'd like to see the first series again might want to visit HMV, who have the disc for a spiffing £5.99, here. Recent additions to the Incoming database include a number of new Network announcements, another Assault on Precinct 13 Special Edition from Optimum; a bunch of new Blu-ray announcements from Sony and Fox; and two titles that Second Sight seems to have licensed from American label Criterion: Ronald Neame's 1980 spy caper movie Hopscotch, and Franju's classic Eyes Without A Face ( aka Les Yeux Sans Visage). Another day, another press release from Fox saying some of their forthcoming Blu-ray titles have been delayed. This time it's Master and Commander and The Day After Tomorrow, and they've been postponed until April the 28th. BBC Audiobooks have announced that they will be releasing an exclusive audio-only Doctor Who title, Pest Control, on CD (only) on May the 8th. It will be read by David Tennant his good self. 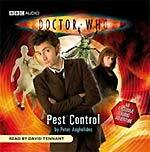 Pest Control was commissioned from author Peter Anghelides: "I love David Tennant's work on the book adaptations, so I'm simply thrilled that he's reading this special audio. He phoned to discuss the characterisations, and my younger son picked up. How great is that? A phone call from the Doctor!" ‘Incoming!’ bellowed Harrison from the middle distance. A dull crump sounded from beyond the truck, and a fountain of black earth spurted up into the air and scattered over them. There was a fizzing sound of energy. The remaining soldiers leapt out of the transport vehicle, fresh weapons in their hands. Harrison had appeared by Donna’s side. He was looking to her for orders, she realised. She wasn’t in uniform, she wasn’t able to command him, and all because of a simple misunderstanding. Harrison’s eyes glazed over. He toppled face forward and sprawled in the mud. Only then did Donna know what the fizzing sound was. Weapons were firing. Harrison had been shot dead in front of her. The dun-coloured shapes of more soldiers scurried past, taking positions. It took Donna a moment to work out what they were doing: they were aiming their rifles upward. She followed the direction of their weapons. She stared in disbelief. Donna could make out thin legs on fat, swollen bodies dropping from the invisible sky. The air was alive with gunfire as the creatures fell through the fog and clattered to the ground. Next week we have a BBC Audiobooks competition for the latest Doctor Who CDs, including three new series stories (Forever Autumn, read by Will Thorp; Sick Building, read by Freema Agyeman; and Wetworld, also read by Freema Agyeman), and a new TV soundtrack release, The Monster of Peladon, a Jon Pertwee Doctor Who story with new narration by Elisabeth Sladen (who plays Sarah Jane Smith).